Moore Consulting LLC is a small but professional web consultancy, based in Santa Fe, New Mexico, and headed by David Moore, who has 15 years web experience at the highest level. Our focus is on creating websites that are clear and effective, working well for clients and users. We particularly focus on sites for non-profits, photographers, architects and lawyers. We’ve worked for commercial and public sector organisations of all sizes, and our sites have been received regional and national press coverage. Many of our sites are built with Wordpress, which enables clients to manage and update the content themselves. Our photographers' sites often integrate Wordpress with Photoshelter to make updating text and images straightforward while presenting a unified look and feel. We also offer content creation and social media consulting services, helping to keep your online presence stocked with fresh and well-written material. Moore Consulting clients include Santa Fe International Folk Art Market, Trey Jordan Architecture, iQ Content (Dublin, Ireland), Santa Fe Prep School, and Alan Ross Photography. 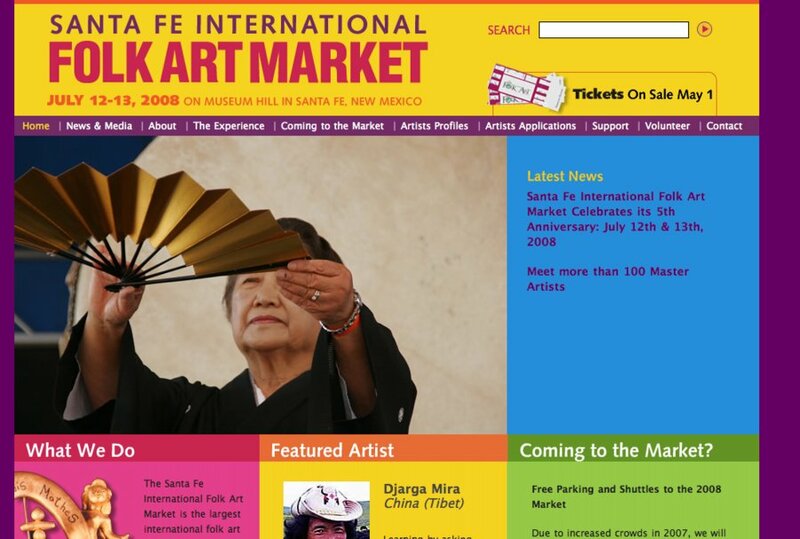 This is a screenshot of our recent site for the Santa Fe International Folk Art Market.